Anytime I get involved in a new project I tend to go a little bit overboard. 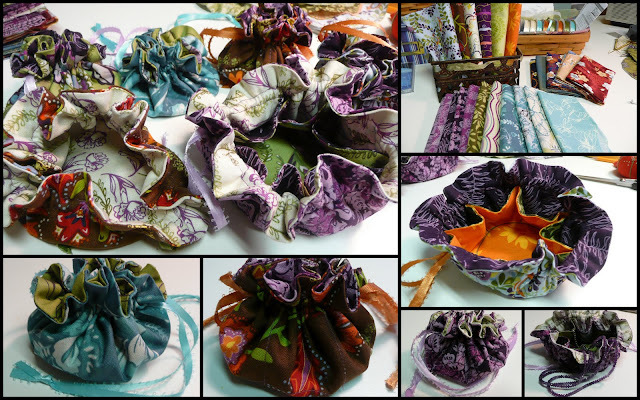 Hence my latest endeavor of making drawstring bags for my jewelry. This first started out as the hunt for a small sewing machine and has bloomed into a fabric/bag nightmare. I will soon have way too many bags if I keep this up, so I'll be putting some of them on my ArtFire and 1000 Markets studios for sale. I am so in love with all the wonderful fabric choices. I haven't sewed in probably 10 years and we didn't have the selection that you do now and I haven't even found the designer fabric section yet....maybe I better stay out of there. Fabric is 100% cotton and is normally used for quilting but makes wonderful little bags. These are small at 9.25" diameter when laid flat, but when drawn up they are nice and compact. Great for slipping into a purse or tote bag. Some have pockets on the inside and some don't so those without will be about 1/2 the price. I'm pleased with how they have turned out. I would love to hear what you think. very pretty! Would make a nice gift for someone. The bags are pretty and I sure understand about where fabric is these days. It's pretty hard to resist buying it! Project or no! Lovely little pouches! I should sew something for my jewellery, but perhaps something simpler. I like the idea of draw strings. You've used pretty fabrics. Maybe I'll post something if I succeed it doing bags worth showing. Yours are really nice. Would you like me to put a link om my blog with "Lovely Pouches" or something like that? Or have you listed them in one of your shops? Thanks all for the comments. Yes Anna, I have now added them to both my 1000 Markets and ArtFire shops, but would love a link back...anytime. Okay, Ms. Casto if you want to review one you got it.